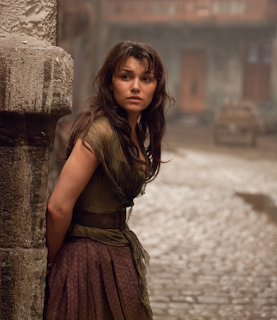 As a young girl, Eponine is spoiled by her mother and father who are innkeepers living in France. She has a younger brother Gavroche whom we do not know is her brother (in the movie), and Cosette who lives with their family. She was always wearing the highest quality of clothing but since her parents were thieves, they could not afford those kinds of things forever. They get kicked out of their inn and move to Paris to live in the streets there where they continue to con people out of money. When Eponine gets older, she is a young woman, very thin and apart of the rebellion. She represents poverty and hard times of common people in that time period. She also represents tragedy because she is in love with Marius but he does not feel the same way about her. She is willing to do just about anything and follow him anywhere but he never sees her as more than just a friend. I thought her death was sadder than any other one because she has to die not knowing or being loved by her parents or Marius. Shes dying because she saved someone else. Dying for someone you love is the ultimate sacrifice but to him she was just a friend. She wishes they could be together but knows it will never happen. Eponine influences Marius because she knows who Cosette is and helps him to find her. As Cosette and Marius fall in love, Eponine is left to watch them on the street brokenhearted. She saves Marius from being shot in the movie and he holds her as she dies. She is able to finally tell him that she loves him and sings "a little fall of rain" with him. Right before she dies she is able to let go of the letter that Cosette wrote to him because she only wants him to be happy even if that means not loving her back. Eponine always had the best intentions and was mainly good. She was always getting the short end of things no matter how hard she tried. At least in her death Marius is there to comfort her and tell her that she is loved.